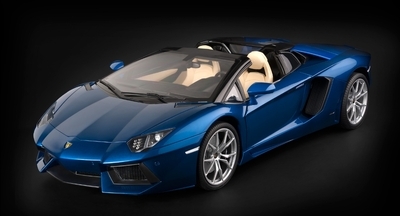 Pocher HK103 Lamborghini Aventador LP 700-4 Roadster – Metallic Blue 1/8 scale model car kit! “In Sant’Agata Bolognese Factory, they have wanted to keep the best for last and thus make themselves a superb 50th anniversary present. The new Aventador LP700-4 Roadster from Lamborghini is far from being only an exquisite style exercise of the Italian firm. The Roadster shares with the Coupe version the impressive V12 6.5 powertrain, which makes it capable of showing staggering numbers (700 hp, 350 Km/h, from 0 to 100 Km/h in only 3 seconds…). This performance, combined with the sensations that an open roof and reinforced carbon fiber monocoque cabin super sports car is capable to transmit, makes driving this model a unique experience.